Tell your loved one how much they mean to you with the timeless poem by Elizabeth Barrett Browning delicately scripted around this exclusive custom coffee mug. The unique design starts with the poem on the front of the coffee mug, wrapping around to the back in a delicate light grey font. 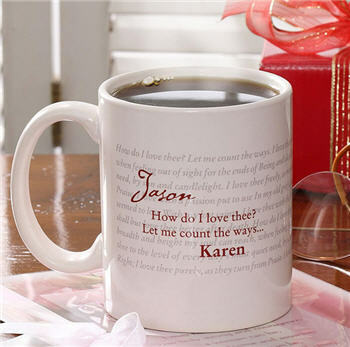 The poem is accented on the front of the mug with your loved one's first name, followed by the first line of the eloquent poem along with your name below, for a very personal touch! Perfect for Valentine's Day, birthdays, or just to say "I Love You!" Ceramic Coffee Mug holds 10 ozs., dishwasher & microwave safe. Personalization Details: Your first name (12 characters) will appear in the upper corner, followed by recipients name in the lower corner (12 characters). Orders placed for this item cannot be cancelled or refunded. Please ensure that the correct spellings for names are used in the gift message.